Oshkosh Defense unveiled a new 4X4 variant of its Medium Tactical Vehicle Replacement truck aimed at increasing mobility while preserving payload, company officials said. At 34,000 pounds, the new MTVR variant is roughly one-half the weight of the standard 6X6 MTVR while still carrying a 10,000 pound payload capability, Oshkosh officials said. “The idea of the 4X4 is to give the commander more flexibility in terms of what they take with them. 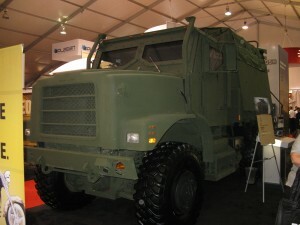 For a little bit of tradeoff on the payload, they get considerable volume savings,” said Oshkosh Defense CEO Andy Hove. There are roughly 10,000 MTVRs in the Marine Corps fleet; Corps officials said they were interested in the new variant. “The Oshkosh 4X4 is something we are interested in because it is lighter and has nearly the same capability as the full-scale MTVR,” said Dave Branham, Marine Corps PEO Land Systems spokesman.